Most cellphone users put their cellphones on their pants pockets and when left unlocked, there is high probability to make accidental phone call. To help you avoid such calls for Android phones, you can install an app that was designed specifically for this. 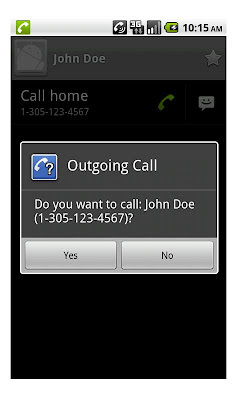 Outgoing Call Confirm android app gives you a chance to confirm any outgoing calls before they are dialed. It shows you a confirmation message with the contact name and the number being called. You can either choose Yes to proceed with the call or No to cancel it. Once installed you can configure the app by going to its main interface. You can change some settings by tapping Preferences. 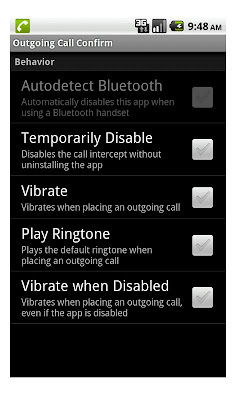 Settings includes auto disable upon Bluetooth detection, vibrates when placing outgoing call, play a ringtone, and etc. The Stopped Calls screen has the history of all the outgoing calls cancelled via Outgoing Call Confirm.